Launched in March by the then Housing Minister Brandon Lewis MP, the British Homes Awards challenges architects and designers to produce a standard house type suitable for Garden City type developments, with a focus on innovative designs which are both buildable and replicable. This year all entries must be designed using H+H aircrete blocks. 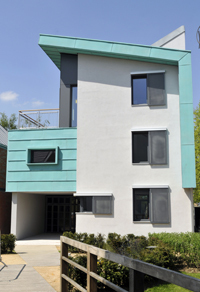 Architects and designers are challenged to produce a standard house type suitable for Garden City type developments. The closing date for entries is 10 July, however all entrants need to be registered by 12 June. The winning design will be announced on the 16 October and will be built by Redrow Homes using H H aircrete blocks and build systems. Jenny Smith-Andrews, marketing manager at H+H, said: ñHouse building is fundamental to the success of the construction industry in the UK. Not only is it vital in terms of the economy it creates and the security it gives people but it is also important to the industry’s evolution. She continued: ñFor many, innovation and change means something brand new, but over the years H+H has proven that a product or system does not need to be new in order to bring about change in house building.